The New York Green Advocate: Water World Here We Come: Are Floating Neighborhoods in New York City's Future? Water World Here We Come: Are Floating Neighborhoods in New York City's Future? No sooner have derelict 19th Century era urban waterfronts become revitalized that we confront global warming induced rising sea levels that could endanger our waterside developments. In the future, potentially catastrophic flooding could be a more regular occurrence in these gentrified waterfront areas. A recent Study by the National Center for Atmospheric Research in Boulder, Colorado concludes that New York City and other areas in the North East of The United States "are directly in the path of the greatest rise" in sea level if Greenland continues to melt due to global warming. 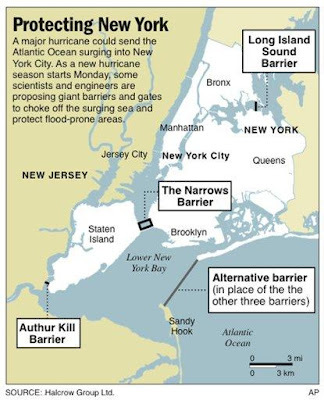 Even at current sea levels, a Katrina like event has been clearly predicted for NYC. But even without a large hurricane, the combination of rising sea levels and increased storm surges is making many people in New York City, and living near the coast around the globe, plan for a watery future. In the 1990s I saw a glimpse of what could come, while living in NYC. A building where I worked on Greenwich Street in lower Manhattan flooded quickly with several feet of water that had to be pumped out continuously during a heavy rain storm to prevent severe damage. And this flash flooding was just from rain, without a hurricane hitting the shore. 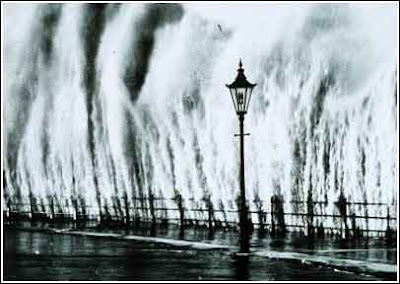 Picture: Waves Crashing Onto Manhattan During 1938 Hurricane. Even more a glimpse of what could come, in 1821 a Hurricane that hit New York caused the entire city to flood below Canal Street when the tide surged 13 feet in one hour. But, just like you can't fight progress, perhaps the best method to deal with rising sea levels and storm flooding is not just to fight the tides by building multi billion dollar sea barriers, but to go with the flow via clever ingenuity and engineering. Klaus H. Jacob, a Columbia University climate-risk researcher said in a recent AP article that New Yorkers, instead of fighting the tide, could instead prepare to: "live with the water, rather than fight it", he said, "by taking such steps as making tunnel entrances sealable and moving buildings' electrical and other vital equipment from basements to higher floors." Klaus Jacob is correct in his thinking. But what he didn't mention was the movement toward floating real estate developments. With potential rising sea levels and regular flooding, building homes and communities on the coast that can float is a no brainer. Thankfully,the world's creative brains are already coming up with building methods that blow the lid off of the current concept of waterfront living. In the Netherlands, for example,they've been building floating homes for hundreds of years. 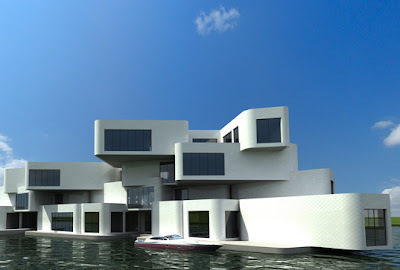 Today,visionary architects and designers are developing floating apartment complexes and neighborhoods, such as the Floating Dutch city IJmeer. And, the Dutch are not alone. 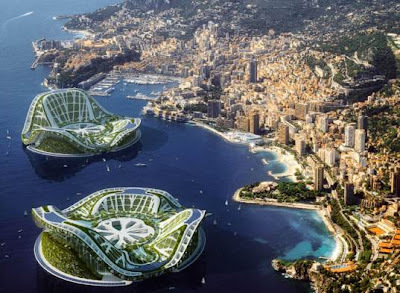 Belgian architect Vincent Callebaut has designed a concept for self sustaining city islands of 50,000 people that can house populations who were displaced from flooding. Some of these concepts might seem far fetched, but they are not. While not as futuristic, yet, Seattle has the East Lake neighborhood where floating homes are not the exception but the norm. Courtney Cooper, an EcoBroker in Seattle. 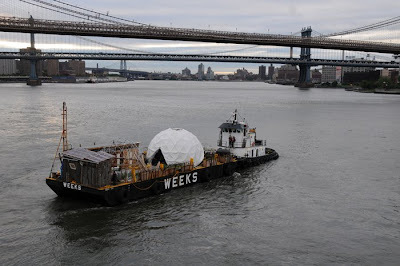 Closer to home, a group of NYC artist activists have put together the concept called Waterpod, which is the model for a floating self sustaining community on a barge. As the picture below depicts, the initial Waterpod concept started kind of small in scale and seems a bit rough at the edges, especially compared to the grand schemes of floating cities and neighborhoods envisioned across the globe. But, the Waterpod's homegrown grass roots efforts are just a starting point. The model drawing below shows an expanded Waterpod prototype that could very well be floating in NYC's Green Future. Photo: Advanced water pod concept prototypeWaterpod™, rendering by James Halverson of Lux Visual Effects. The future of NYC means a changing coastline. 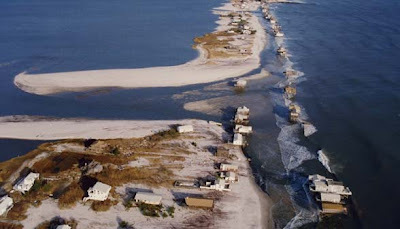 Seaside living will require adapting naturally to higher sea levels and storm surges. As the coastline changes with storm surges, rising sea levels and tides, surely, New Yorkers will change with it. Photo: Still from new documentary film "Incredible Journey: The Story Of West Hampton Dunes"
If we want to expand areas near the coast, communities should not be built on landfill, like Battery Park City in New York. 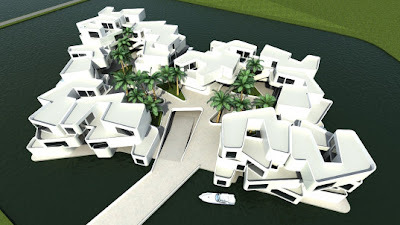 Instead, whole floating neighborhoods can be planned. We'll look back nostalgically at houseboats moored at docks on City Island in the Bronx or at the 79th Street Boat Basin. The future will bring floating neighborhoods, cities, self sustaining enclaves that come and go with the tide if they want to. 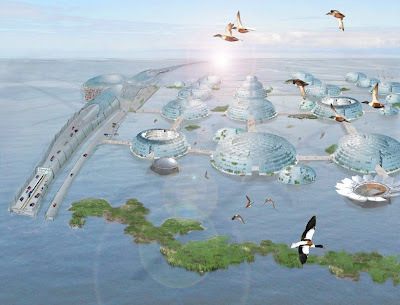 And island cities, like the Lillypad, could be designed that can come and dock in New York, much as Queen Elizabeth Cruise ships of the past,yet, this time, with passengers that happen to live there in zero net energy homes, and even have their own seaside garden. Surely, the chic Citadel project (picture above) in the Netherlands reminded someone in Southampton or East Hampton Long Island of the hurricane of 1938 when whole sections of the Hamptons coastline was lost forever. If we are wealthy enough to build on sand dunes that move or get wiped out because of mother nature, why can't we build floating neighborhoods that move at our command? From the Hamptons to NYC, instead of just worrying about the "Weather Channel tragedy" to come, let's plan for a visionary New York and Long Island. Let's envision new neighborhoods on the coast - like Float Hamptons, with some affordable units mixed in, of course. Or, how about Float Burg off the coast of Brooklyn? You think Float Hamptons or Float Burg is far fetched? 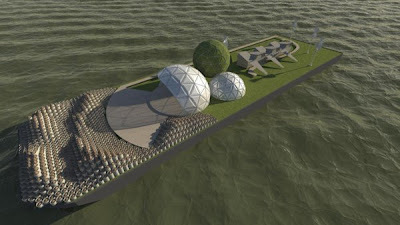 Look for a future post I'll do on another real Dutch treat being proposed in the Netherlands: A Floating Beach. You can't make this stuff up. Seems like fiction. But it's going to happen. Beautiful photos. 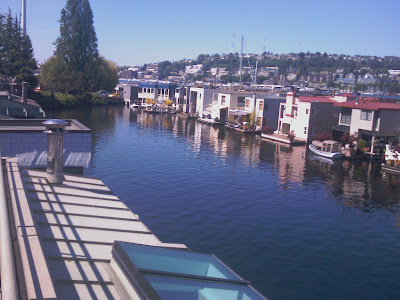 Our floating homes in Seattle are really close-knit, attractive communities. Living on the waterfront is a great lifestyle.